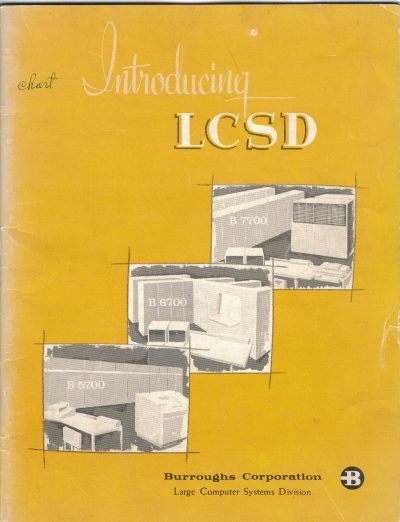 It all started in 1960 with the Burroughs B5000, but that computer really did not work very well because of hardware implementation problems. Quickly Burroughs came out with the B5500, a much more reliable and much faster implementation. The next machine in the series was the B6500, delivered in about 1968, which also significantly enhanced the instruction set. The B6500, like the first B5000, had reliability problems, and was quickly replaced by the B6700. New technologies led to the B6800 in 1976, a higher performance and lower cost version of the B6700, with a new memory architecture. Following the B6800 was the B6900 first shipped in 1980, which used EPROM state machines to lower the cost further and a new, Universal IO system. The B6900 was the last of the “E-mode” machines that were implemented primarily in hardware. 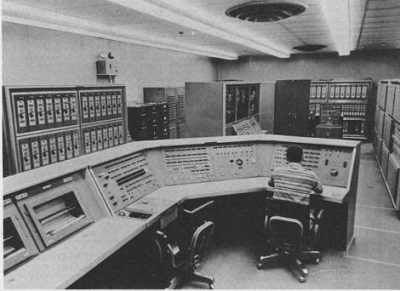 The Burroughs B5000 was originally produced by the Large Systems group in Pasadena CA. After the B6500 the group moved to Mission Viejo, CA, while Medium systems (based on a decimal architecture) remained in Pasadena. The Burroughs Paoli, PA plant built large, special purpose computers, mostly for the military at the time, but wanted to build commercial machines. In the early 1970’s the B7700 was built by Paoli and was the first “Very Large System” build by Burroughs as a commercial product, and it was an E-mode machine, with some modifications. So, by the end of the 1970’s Burroughs Large Systems (B6800) and Very Large Systems (B7800) were stack architecture E-mode machines. Medium systems (B2800-4800) were decimal machines, and small systems (B1800) were bit addressable emulators. When I joined the Mission Viejo plant in 1978 the B6800 was in production. The B6800 was a major improvement over the B6700. It was smaller, faster, sported a new “Global Memory” architecture which really improved multi-processor configurations. Burroughs had a success on its hands, and the Mission Viejo Large Systems Plant was a corporate hero. Next on the schedule for development was the B6900, which was going to ride Moore’s law to higher speeds and better performance, but there was a hitch.